Pieces of paper can get lost, spilled on, and destroyed in several ways. But for some of us, paper is still where we take notes, make comments, etc. Always save digital images of those paper notes that you make. 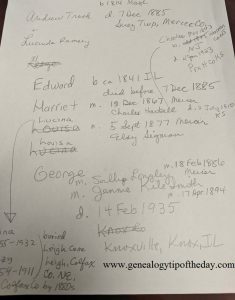 The notes on the page in this illustration are for my own personal use–there are no citations or any of the other niceties that genealogists need. I was simply trying to sketch out the family relationships for my own personal, internal use. Yet I don’t want to have to repeat that process and I may want access to those notes later when my files are “not handy.” A digital image is a great way to do that. Just make certain you get the whole page when taking the picture. I do that, too! And sometimes they make NO sense the next day. I’ve been going through those paper notes this past month, working them out so I can go forward or file. I’ve learned that keeping the paper scraps that didn’t work is good. I am lucid enough yet that most names in the branch I’m working on do ring a bell in my head and I don’t have to research that idea more than once (or twice). Three days ago I ran across the answer to one of those scraps of paper. And it wasn’t the answer I wanted. Darn! That answer might throw a monkey wrench into anyone doing Y DNA on the Dodd family 1777ish. If you are Dodd and your Y DNA doesn’t work, check the Ward/Wardel group. I take a lot of these notes while at the Family History Library in Salt Lake City when I’m locating various records, etc. I usually don’t fully analyze those documents while I’m in the library making copies, but I frequently notice little things as I’m copying, have ideas while I’m finding things, have records that are supposed to be on the film and can’t actually be found, etc. I take a picture of those notes and put it right there with the images. Keeping the paper separate from my images is just asking to lose it. And like you, sometimes when I go back and look at that paper’s image, there are some notes that I can’t quite remember why I wrote. But at least I have it because sometimes it later “dawns” on me what I meant. CamScanner is an excellent App for this purpose. ← Who Else On the Same Day?